Using two forks, or your hand shaped into a stiff claw, mix all ingredients. Mix well, but do not squeeze meat through your fingers or over mix. Mixture should appear aerated. Form meatballs gently by hand or by using a self-release ice cream scoop, keeping the size to just under 1 oz. Heat oil in a large non-stick skillet or cast iron over medium heat. Once the pan is hot, begin adding meatballs. Fry 10-12 at a time. Rotate meatballs to promote even browning on all sides, every 2 minutes. While meatballs cook, add chicken stock and turn heat up to medium-high. Gently shake the pan to keep meatballs moving. Meatballs are ready once chicken stock has evaporated. The liquid will be gone and meat will be glossy and cooked through. · Don’t squeeze meatballs or roll them for too long. Meat mixture should retain the fat. · Use sausage for extra flavor. Ground pork is fine, just bump up your salt and seasonings. 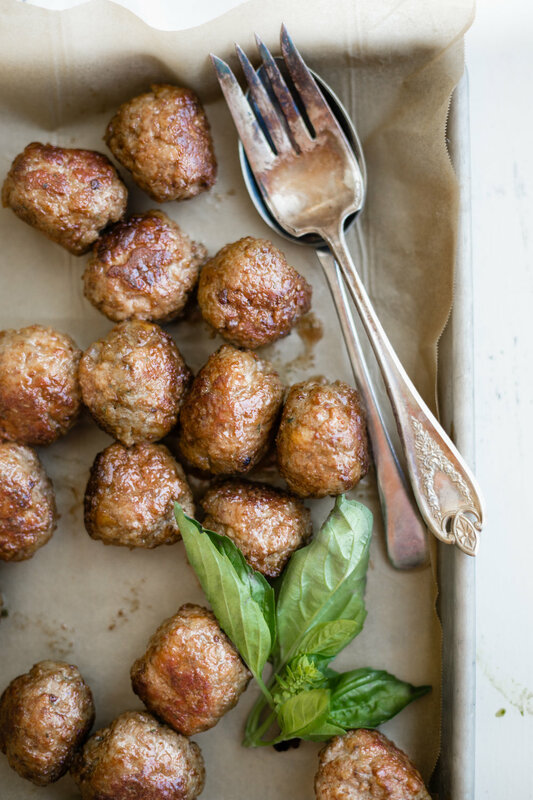 · Feel free to add ANYTHING to tailor these meatballs to your liking: ricotta, fresh parm, Dijon mustard, fresh herbs, or white wine. These are all excellent additions. The pesto recipe from our last post is an AMAZING accompaniment to these little guys! This will be your holy grail meatball recipe to work from! Pulse bread in the bowl of your food processor to make a fine crumb. In a bowl, combine meatball ingredients with bread crumbs and mix well with a fork. Shape meat into balls a bit larger than a tablespoon. Sauté in olive oil over medium heat in a large non-stick frying pan. Once the balls are set but not cooked through, add 2 cups of sauce and simmer for 5-10 minutes over low. 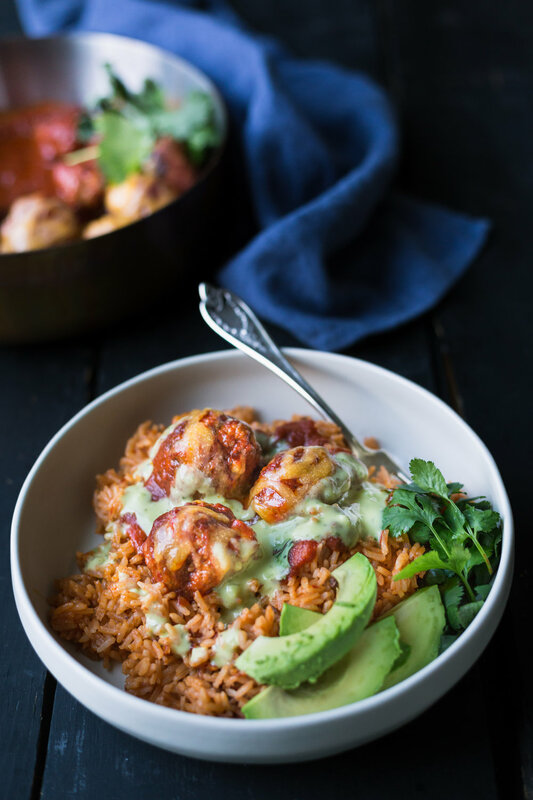 When meatballs are ready, cover in cheese and serve with rice or veggies. *Cheese is not included on the whole 30 diet plan and may be omitted from recipe. In a large sauce pan, sauté onion in olive oil over medium heat until it begins to caramelize. Add dried chilies with seeds and stems removed. Sauté 2-3 minutes and add garlic. Continue cooking until garlic becomes fragrant. Season with salt and pepper. Add chicken stock and tomatoes, and bring to a boil. Turn off heat, cover pot with a lid and allow chilies to steep for 20 minutes. Blend the mixture with a stick blender or in your standard blender. Bring enchilada sauce to a boil again and taste for seasoning. Add salt and pepper. If the sauce is thicker than you’d like, add a bit more chicken stock or water to thin. This sauce packs a mild heat and has a rich smoky flavor.